This isn’t the post I wanted to write today, but thanks to recent events, I’d like to discuss the difference between inspiration/influence and copying when creating designs (I’m talking specifically about my crochet patterns, but the same applies to any designer in any field, whether they produce patterns or sell finished items based on their designs). Many times in my almost 5 years as an amigurumi designer, I’ve experienced other ‘designers’ copying my designs and selling the resulting patterns. I’m not talking about the outright theft where a person buys a pattern, copies it, and then sells it as their own work: my experience is a less obvious, less tangible theft, where people look at my photos and replicate my design without ever having seen the pattern. For those designers, I’m giving you the benefit of the doubt by assuming that you may not yet realise you’ve done anything wrong, and I hope that this blog post will help to clarify the distinction between inspiration/influence (acceptable) and copying (not acceptable). I read up all about Pterosaurs and viewed photos of skeletons and pictures of artist’s renditions. I looked at commercially-produced Pteranodon/Pterosaur/Pterodactyl toys, both plush and plastic/rubber type. I looked for existing knit and crochet Pterosaur patterns, so I could make sure my design would be original. I checked to see if there are any Pterosaurs in popular culture (books, movies, TV shows, etc) that may influence people’s perceptions. Now, armed with all my research, I could begin my design process. I figured out what, to me, are the essential characteristics for my design, and what I could omit and still have it be recognisably a Pteranodon. I interpreted those features to create shapes and an overall look that would fit in with my ‘PlanetJune’ style. I worked out elegant methods to build those features into an amigurumi design. I created a sketch of what I envisioned my final Pteranodon would look like. Finally, after going through all those steps, I could pick up my crochet hook and begin to crochet my sample and to create my pattern. As you can see from my sketch (sorry about the quality, it was never intended for anyone other than me to see! ), 90% of the design was created before I ever picked up a hook – I just refined the proportions while I was crocheting to make it more elegant. Now, let’s say that a couple of fellow designers (for the sake of simplicity in writing I’ll assume both are female) see my dinosaur patterns and are inspired to create their own. Is this acceptable? YES, of course. I am not the first person to crochet a dinosaur, and I wouldn’t want to be the last. Designer A does some research of her own and creates her own interpretation of a Pterosaur in her own design style. Maybe it’s crocheted in more than one colour; maybe it has an open beak; maybe it has legs; maybe its proportions are more realistic (or more cute’n’cuddly) than mine; maybe it has embroidered detail or crocheted textures; maybe it has felt accessories glued on; maybe it has big cartoon eyes, or any of a million other differences that make it her own design. Yes, it’s a Pterosaur, but it’s clearly a ‘Designer A Pterosaur’ – it fits in with the style of her other designs, and naturally any resemblance to mine will be based on the fact that we both used a real animal as our inspiration. Designer A decides to sell her Pterosaur pattern. Is this acceptable? YES, unquestionably. I’m happy if I can inspire another designer in this way. Designer B looks at my Pterosaur, figures out what crochet shapes and stitches she would need to replicate it, and makes a close copy of her own. Is this acceptable? Let’s say MAYBE. I’m not thrilled, but if people have the talent to replicate my work without purchasing my pattern, for their own personal use, I can’t stop them. It happens. I’ll survive. Those people would never have bought my pattern anyway, so I’m not out of any money as a result. Designer B now decides to sell the pattern for ‘her’ Pterosaur. Is this acceptable? NO, absolutely not. Designer B has copied my design. No, she hasn’t copied my pattern, but those design elements that I created in my research and development process listed above produced a design that is my artistic creation and my intellectual property; it’s my interpretation of a Pterosaur. She has directly copied that without going through any of the work I went through to create it in the first place. If you show a picture of my Pterosaur to anyone who is familiar with the field of amigurumi, they’ll know it’s mine and will recognise my style. Designer B is harming my income. By replicating my design style, she has cut into my market: anyone who wanted to buy a pattern for a Pterosaur and likes my style now has two choices for who to buy from. If she decides to sell at a lower price point, how many unwitting Etsy customers will choose my pattern over an almost-identical cheaper version? Designer A’s Pterosaur does not harm my income: a customer will either like my style or hers, or both, and will buy the one they like best, or both. But nobody would choose to buy two patterns for practically the same design. I’d like to make it clear that although events of this week have precipitated this post (and thank you to everyone who notified me of the copying in question), my intent is not to single out any one person – I’ve experienced copycats for years now, but I’m intentionally not showing any specific examples. It is possible that some cases of ‘Designer B’ that I have experienced are purely coincidental, but the more identical design elements that exist between the two patterns, the less likely it is that we reached the same point independently. Recreating an existing design serves only one person: the person who has recreated it. Pattern buyers gain nothing from the addition of a second copy of the design, and the original designer only loses by the existence of the copy. If you’re looking to build a career (or even a hobby business), then getting yourself known as a copycat is not the best long-term strategy. If you instead put the effort into creating your own style and your own original designs, you can build a loyal following and, in time, become known and respected as an artist and a designer. It’s not the easiest path, but it is, ultimately, the most rewarding. I have a question: what if someone designs their own pattern in a style like yours? Like if they design something you’ve never designed, like a giraffe, but it looks like your style, like if June was going to design a giraffe this is what it would like, but it was actually Casey who designed it. Would that be okay? Well, Jeff, for a start, even I don’t yet know what a PlanetJune giraffe will look like! But if you mean that ‘Casey’ designs a giraffe that looks like my most similar pattern (that’d be my alpaca, in this case) with a couple of modifications to make it look more like a giraffe instead of an alpaca, I’d still advise that Casey develop her(/his) own style. If Casey wants to make a name for herself, it won’t do her any favours if someone sees her giraffe and thinks it’s one of my designs! I’ve bought commercial fabric with that’s had “not for projects to be sold” printed on the selfedge; it featured a trademark children’s character. I think it shows you can set conditions on patterns should you choose to, it just must be clear at time of sale. Your designs are fab BTW! Good advice (about not buying a pattern if you don’t like the terms attached with it). What would you do though if the terms weren’t listed until you bought the pattern, opened the pdf, and there at the end of it it says they don’t want you to sell the item? Kind of sneaky, if you ask me (not to mention anger inducing). I’d go with a “once bitten, twice shy” policy – you’ll know not to buy from that designer again if you’d like to sell your items. And maybe in future, check with a designer before purchase to make sure their terms are agreeable. Hi, June. I understand what you are saying here and I agree with you. I know you’ve already specified that selling a pattern is very different than selling an item made from a pattern. However, a lot of people on here seem to be posting that they are afraid to sell an item they made from a pattern they bought. From the research I’ve done, everything I find basically says (and I’m obviously paraphrasing here) that it is perfectly legal to buy a pattern and then to make an item from that pattern with the intent to sell that item. Even giving credit for the design is not legally required but only a courtesy (one that I think is very fair). It is my opinion that if you don’t want people to sell the item they made from your pattern, don’t sell patterns. There are a number of people that say you can’t sell the item you make from their pattern (ie. you can only use the pattern to make an item for “personal use”). However, they have no legal right to make that demand. Furthermore, it seems a little rude to me. You’re either in the pattern business or the finished article business. If I buy a pattern, it is my time and effort that makes the physical item. Legally, that physical item is mine to do with as I please. So, basically, if you make something from a pattern, don’t be afraid to sell that item (regardless of what the pattern says). Personally, I like to crochet (healthier than smoking and/or eating when bored!). At this moment I have no interest in design. However, I also don’t want to keep the items I crochet (and your family members can only accept so many crochet gifts with a smile), but I also don’t want my hobby to be a total sink hole for my money. By selling the items I make, I get money to buy more/new patterns from pattern designers and thus keep myself interested in crochet. 1) Copyright: This protects the copyright holder from people e.g. reselling or sharing the pattern, or copying it and claiming it as their own work. 2) Licensing: The terms under which you are sold a pattern (“for personal use only” etc) could constitute a licensing agreement with the copyright holder – I have no idea of whether that would actually be enforceable in court, and of course it’s highly unlikely that an independent designer could afford the legal fees to chase down anyone who sold items made from their patterns. I kind of had the flipside of the situation Michelle talks about above. I’d just started knitting again and didn’t even know what a blog was, let alone Ravelry or Lion Brand or any other source of patterns. I bought a pattern for a bunny from ebay. A few months later I found the same pattern – same formatting, the lot – for FREE on the lion brand website. I was outraged and contacted the seller on ebay. She said “I never said it wasn’t in the public domain”! I contacted ebay. Can you guess what they did about it? Nothing. I did bring it to the attention of Lion Brand and I can only hope that they managed to resolve the situation, but I felt stung and am very wary about buying patterns now. I’m sorry you had to experience that, Wendy! I’ve had a similar experience to Michelle, with people trying to sell my free patterns on eBay. As to your wariness for buying patterns in future, that’s a real shame, and I hope it won’t stop you from buying any patterns in future. My advice would be to check that the seller of the pattern is also the designer. If that’s not clear from the name/username of the seller, it’s a red flag that you should maybe avoid that shop. Hi June! First off – your work is fabulous and it inspired me to get started as well! In fact, as I wanted to design amigurumi dog patterns, I was very weary to ensure that they have a different style and diffierent construction/features than yours and other popular crochet designers. So this post hit directly home for me. As someone who comes from fine art background, I think it’s important for every creative person to develop and create in their own style. We all benefit when each designer takes the time to create something new – the more patterns and styles the merrier! Mimicry and blatant copying are pointless and hurtful. Two questions for you and how you have addressed this problem. (1) Were you able to or did you try to contact the person who copied your pattern? (2) Have you discovered websites that use your images to drive web traffic to them? I have recently found one of my dog pattern photos with a completely wrong pattern (for a completely different animal) on a website for dog kennel supplies. It must be the “wild, wild web”! Many thanks and keep inspiring! You always have the best tips. 1) Yes, in this instance I have been in contact with the designer and the issue has been resolved to everyone’s satisfaction. I’m hoping that this post will help to prevent a similar situation from arising in the future – it’s either ignorance (“I’m not doing anything wrong by replicating a design”) or laziness (“Nobody will notice if I ‘borrow’ a few ideas”) and anyone who reads this post will now know that it IS wrong, and that people WILL notice. I really enjoyed reading this post. It’s nice to read an experienced, published and accomoplished designer/author define the differences between what is and isn’t acceptable in her eyes. Your designs look great and I can’t imagine someone copying them to that standard, but I’m sure people try. I used to dance (ballet) in my spare time and I know that it’s the true professionals that can make a dance move look effortless even though it takes years of practice. Your creations will be the same, people will buy your patterns again and again knowing they’ll make fantastic toys without fuss. I suspect the immitators may sell a pattern or two, but they won’t get a following like your patterns will. I have to say that I’ve seen similar posts to this one on other designers sites. I love your designs and have purchased a couple as well as your book. The thing I really liked about this post is the detail that you went into about your design process. I didn’t realize the amount of non-anatomical research that you do. Thanks for the post and your wonderful designs! I feel your pain. It isn’t fair that you put in all the work, someone comes along and steals your efforts, and then exploits your work as their own. There’s something just downright evil and selfish about that. It’s happening more and more, as your “You Thought We Wouldn’t Notice” link attests. But watch this video, and consider the ramifications of doing work in the internet age… Yes, copying is lame. And what they’ve done to you is wrong. No question. But the only way to combat it in today’s era (when copying is so prevalent) is to up the ante and make something unique enough that it can’t be easily copied… I know it’s hard to figure out how to make something like a knitting pattern special enough that it can’t be easily replicated (kinda defeats the purpose), but that’s the challenge. It’s not fair, but I think we’re all (crafters and artists alike) going to have to develop deeper reservoirs of creativity that mark our work as singular and unique–so much so that it’s not feasible for someone else to copy it without obviously being a rip off artist. But, in the case of my pattern designs, doing this really would, as you said, defeat the point! A great part of the design challenge for a pattern is to produce something that will be easy and enjoyable for the customer to reproduce by following my instructions, as well as looking nice (I’ll be writing a separate post with more about this process). Adding complexity just to avoid being copied would make my patterns frustrating to follow, and that wouldn’t be fair to my customers. A copy of my design may look similar on the surface, but is likely inferior in terms of construction, assembly instructions, and accuracy, as well as a host of other elements that I concentrate on for every pattern. My real challenge is to make it crystal clear to a new potential customer that my pattern is of better quality than any copycats – I don’t think it’s really obvious until the customer has already made the purchase. I’m not a natural salesman and find it very difficult to write that sort of “my patterns are the best!” copy – it just sounds like boasting to me. Especially in the indie design business, where one person is usually the entire business, I feel that integrity and reputation are the key to long-term success. That’s why I won’t be modifying my design style simply to avoid copycatting, although after writing the above paragraph, I think I may need to revisit my (non-existent) sales and marketing strategies so I can outshine the copycats and dazzle potential customers! Most of my business comes from repeat customers and word-of-mouth recommendations, and my guess is that the lazy copycats can’t say the same. hey there, I’m really sorry for you! This is a reason why I never strted a blog before, because I’ve heared of this cases before… But when you start a blog, it’s just totally malhonnest(don’t know if say this in english^^) to copy work for your own gain! I hope people will understand the effort you’ve done to get the final result, cause thet’s what make’s your work so worth. As a fellow artist, crafter, beginning designer, and just someone who loves your work I felt the need to comment here. I’ve heard and been a part of the general discussion of copyright infringement and know all too well how sticky the subject is. Admittedly, as an artist in a number of mediums I have seen styles (like drawings) I simply loved and have adopted elements myself (I will add that most of my drawn artwork are of a reproduction style however, or a “mish mash” thereof – I like this piece and that piece both both pieces are separate.) However, I draw these things as gifts, because I like them, as homage – not for profit. However, I have seen concepts I like that I wanted to adopt. For example, I noted a given piece and liked how it came out, realizing there was something in the technique of it’s construction. So to learn said technique I would attempt to make whatever it was. (Like to make a round object, make steady even increases every so many stitches…) Generally speaking if I get inspiration from something I initially make a test following the given instructions, just to make sure I understand what I need to be doing. After that I pick things apart and do my own thing with it. I wouldn’t make a pattern for it to sell and I don’t say that it is entirely me or anyone (because it’s not)…take my “Toxic Waste Apple” – I liked the shape of one apple, but the leaf of something else, I made it this ridiculous color (BRIGHT orange) and added a “toxic waste” symbol on it in another color. I sell the apple, but no pattern made from it, and I’m not even mass producing the apple, I made one and may likely not make another one anytime soon. I guess with all this I am asking where would this given scenario fall? Of course I don’t mind! I had hoped that the content of this post would be interesting as a look at my research process as well as illustrating my point. I will write another post about design process – thanks for the idea! 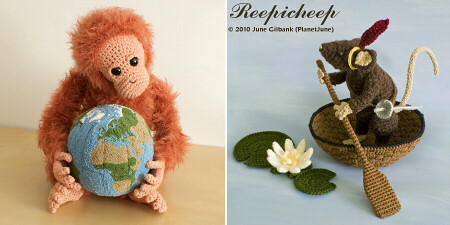 Interesting to take a peek at your design process – I always take a look on sites like Ravelry, Etsy, etc, to make sure I’m not reinventing the wheel when coming up with a new amigurumi, and I search the internet for pictures of the real creature/cartoon interpretations/toys, etc. It’s nice to see that you do this too, makes me feel like I’m on the right track! Well, of course there’s no right/wrong when it comes to art and design; everyone’s process is different. Some people may work purely from images inside their heads and need no other visual reference. I’m not talented in that way, so, for me, the more research the better! I’ve heard the saying, “Imitation is the sincerest form of flattery”; however, I draw the line at what amounts to theft. While there really isn’t anything new under the sun, and many folks are inspired by what they see and experience, there is a big difference between something that is similar, and something identical, despite different methods by which to achieve the same finished product. This lady has class!!! Just wanted to share this , as it also pertains to this subject!!! I Just think she was such a big person to be so non-uptight about the subject. Read #37 in the list, if you don’t want to read them all. This is unacceptable and utterly dishonest. Anyone who’s gone through high school (in the US) is MORE THAN aware of the *concept* that ORIGINAL source material must be cited, and claiming something as one’s own that is clearly not from oneself is plagiarism, whether it’s reformulated in one’s own way or re-produced exactly the same. Designer B may be in the grey area about whether it’s a reformulation or an exact copy, but if it looks so much like your design, then its existence is hardly questionable vis-a-vis the *concept* of plagiarism. Your designs are genuinely unique; I can recognize them in a line-up of pictures; they do not look like any others I find. Though I doubt you’ll find solace in the fact that by copying your design Designer B is flattering your achievements as an artist, s/he is nonetheless evidencing the uniqueness of your work. And, Designer B is well-aware of this as s/he peruses your site with the intention to produce an almost exact replica. I blogged not too long ago about this as well! I’m not a designer, but I always say I got this pattern from so-and-so, or this-or-that website, I post a pic of it, and then next thing I know someone who claims to design is now producing the EXACT SAME HAT, calling it a different name, and calling it their own “original” design. It makes me so mad, so I can only imagine how you, an actual designer, must feel! Where do we draw the line, though, when family asks us to make something they like that we’ve made, but it’s not our own design?? They’re paying me for that actual labor, but I still won’t do it because I’m afraid I’ll violate some law! That is more where I struggle . . . . is it ok as long as we give full recognition to the original designer??? Just curious . . . . For instance, a really good friend of mine has been asking me for ages to crochet her up some cute animal hats that I’ve made my own kiddos, yet I’m worried about doing so because she wants to put them in her boutique. What are your thoughts on this?? I’d say, the more professional your venture, the more careful you need to be. Aunt Jane paying you for your time to make her a scarf like the one you made for yourself is not in the same league as selling multiples via a boutique or online! To be safe, you should always check with the original designer of the pattern, and see what their policy is on selling items. Many designers do not allow any sales of items made from their patterns, but policies do vary. Personally, I’m very happy for people to sell items they’ve made using my designs, provided they give me credit as the designer on the item tag (or in the listing if it’s sold online). I’m sorry this has happened to you but don’t let it get you down too much. Imitation is the highest form of flattery. From what I understand of copyright and trademark laws, there’s little that can be done. You can of course request a cease and desist but there’s no real push behind it. This happens ALL of the time in the fashion world– a designer unleashes a gorgeous dress on a starlet on a red carpet. Next month, you find the perfect copy at David’s Bridal and such. Honestly? I say pat yourself on the back. If this was done in the manner and with the intent you’ve described, that person will have to deal with the ramifications one way or another. You have a clear conscience and that’s the important factor. You have loyal clients. You have a wonderful reputation. No copycat’s going to get to your level by going the copycat route. They might try riding your coattails but that takes nothing away from you as a designer. You’re wonderful and very talented. Clearly, they aren’t. You’ll be fine. I know it. That’s true – thank you! I have heard about this issue in the past, and I think that you have done an amazing, non-dramatic job of explaining the situation. I don’t believe that anyone could replicate your patterns with as much accuracy or finesse as you have been able to design into yours. I wish you the best of luck in this and will definitely be on the lookout even more now for copy-cat patterns. I think your descriptions of what is inspiration vs. what is copying are succinct. Thanks for your support, April! I do try hard to keep my reactions fair and professional, even though a situation like this always feels like a very personal attack. While I will admit that I have looked at something like jewelry or a household item at a craft fair and thought “I could make that,” I know deep down I never would. Out of respect to the crafter, I consider whether it’s just cute or something I really want – if it’s a want, then I give the crafter their money. I will also admit, however, that sometimes the crafts I see at fairs are… how can I put this delicately… awful? The idea is good, but in need of improvement in materials, etc. In that case, I might take that idea and update it for what I’d like it to be, improve the design, etc… but only for my own use. I’d never feel comfortable selling something I didn’t make up unless I had permission (one dragon stuffed doll pattern I have gives permission to sell 10 finished designs per year, but not the pattern). As to your designs, June, honestly I don’t know how anyone could figure them out! They’re so precisely done and cute; take comfort in the fact that even if Designer B did figure some of it out, it won’t ever look as good as yours. Designer C, on the other hand… that’s just unacceptable. May he/she be tangled in UFOs and cheap yarn forever! See something and be inspired to create an original, unrelated, design of your own. See something and be inspired to create something similar for your own personal use. Copy the item for your own personal use. Show a picture of your copy on your blog, with credit to the original designer for giving you the inspiration. Blog about making it, with no acknowledgement that it wasn’t your own idea. Make a tutorial showing how you made it. Sell ‘your’ product (or tutorial). It must be very frustrating for you. Do you go after people who infringe on your copyright and trademark(s)? I also wonder if it would be economically feasible for you to patent your designs. With all of the wonderful opportunities the Internet has opened up to artists and designers, it has also opened up opportunities for unethical people to copy talented people and try to make a few dollars riding on others’ coat tails. Good luck fighting the battle. I’ve looked into patents, and it’s not a practical solution for designers – it’s a very long and costly process. With or without a patent, it would be very hard (and expensive) to prove in court that copyright infringement has taken place, and sadly it seems to be happening all the time, to all kinds of designers and artists. I for one would always come to your website first for my animal patterns because they are the best.